Urban Forage Winery and Cider House picks Plymouth apples. The space is hip, warm and inviting. The lighting is low and cozy. “We wanted it to feel like a bar that didn’t feel industrial and warehousey. And we wanted it to be a space where everybody could feel comfortable. The aesthetic is more like a coffee shop," says Jeff Zeitler, who along with his wife Gita Rijal Zeitler, owns Urban Forage. There are thoughtful touches like a bar cloud (a kind of false ceiling suspended over a bar) made of repurposed doors which lowers the ceiling to make the room cozier and improve the acoustics. Downstairs is where Urban Forage makes their cider, mead and wine in small batches. Almost all fruit, flowers and honey used in production are “crowdsourced”—they get their apples, pears, apricots, cherries and other fruits from local residents’ fruit trees, of course with permission. They also harvest dandelions, hops and other flowers when invited. This past year, a Plymouth family was part of the foraging. 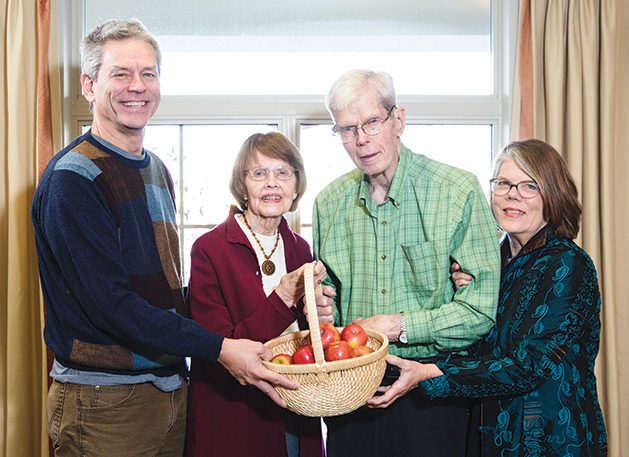 The Fordes, who own a prolific apple tree, donated part of their harvest to Urban Forage. Catherine Day, the Forde’s daughter-in-law, and her husband, the Forde’s eldest son John, are charged with finding a suitable home for the bounty of apples, and thought of Urban Forage. Day had never tried Urban Forage’s products, but had been following them on Facebook and was intrigued by the idea of using foraged fruit to make cider and wine—creating something out of food that might otherwise go to waste, and she appreciated that Urban Forage makes their products in a way that’s green and sustainable. The apples are Haralsons, says Day. “Haralsons are delicious, crisp and tart. Anyone who loves a tart apple loves them,” says Day. But tree owner Ilene Forde isn’t so sure that they’re Haralsons. “My husband planted two trees at the same time,” she says. “One was a Haralson and one was a Haral Red. One grew, and one didn’t. We’re not sure which one survived.” Either way, the tree has been bountiful beyond anyone’s expectations. So Zeitler and crew headed out to Plymouth to pick apples. Zeitler was delighted to be able to use the Forde’s apples, and the family is happy the apples were put to use. “It’s quite an extraordinary tree,” says Day. “They harvested nine bushels, and there were another four bushels on the ground." “We hope the deer and the turkeys got them,” says Day. How did Zeitler become a cider maker? Zeitler began as a home cider-brewer when he was a college student and wanted to drink. He kept up his efforts even after he reached the age when he could buy alcohol. The hobby turned into a passion, which turned into a business, first selling the products only, and then opening the taproom, which has turned into a popular neighborhood spot for trivia, date nights, and just sitting down and enjoying a beverage. “We started with nothing,” Zeitler says. This was an empty storefront and we fixed it up.” They began with the cider works, and later added the tap room. Gita, the other half of the Urban Forage team, works as a public health nurse, and on weekends helps out in the tap room. Her experience as a nurse helps her connect with people. “I can tell what people are looking for when they come in alone and sit down at the bar. Some people are putting out that they want to talk, and with some people you can tell that they want to be left alone.” Before meeting Zeitler, Gita never thought she would have anything to do with cider or wine. She didn’t enjoy any alcohol because it always gave her a headache. “We’re very local and keep the cider very natural. We use few or no chemicals,” says Gita. She believes this is why she can drink the cider without getting a headache, and is happy to be able to provide a product that some people might otherwise not able to enjoy if they are sensitive to additives. Which apples make good cider? Redfield, Haralson and Cortland. Chestnut crab apples (as an ingredient, but not on their own.) England has traditionally grown apple varieties specifically for cider, Zeitler says. These apples have qualities that make for excellent cider, but aren’t very good for eating. “The U.S. used to grow apple varieties that were good for cider,” says Zeitler. While cider’s popularity in the U.S. may seem to have come out of nowhere, cider has a long history here. Before Prohibition, Zeitler explains, New England had many orchards that grew apples specifically for cider. When Prohibition came around in 1920, the cider trees were destroyed, and replanted with varieties of apples suited for eating rather than cider-making. “Prohibition contributed to the lack of diversity in apples in this country,” says Zeitler. Zeitler’s inner science nerd reveals itself when he starts talking about the chemistry of cider. If someone could be in love with an organic compound, Zeitler would be in love with tannins. And that’s a good thing—it’s passion coupled with know-how that make a great product, and Zeitler has both in abundance. And sing they do. You can try them yourself--semisweet sparkling cider and Gin Botanical Cider are for sale by the 22 ounce bottle at 40 liquor stores in Minneapolis, St. Paul and the suburbs. Other varieties are for sale only at the taproom on Lake Street in Minneapolis. Some of the stores near Plymouth that carry Urban Forage’s products are MGM and Total Wine and Spirits in Minnetonka, Westwood, Liquor Boy, and Top Liquors in St. Louis Park, and Edina-Municipal Liquor. To learn more about the science behind Tannins, check out Wine Enthusiast’s article, “What Are Tannins, Really?” in their Sept. 11, 2018 issue.